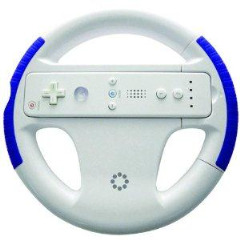 The rubber hits the road with Memorex Racing Wheels for Nintendo Wii™—the only racing wheel in the industry to feature rubberized grips for better traction along with a spring-loaded trigger button for a true gaming advantage. A hidden compart¬ment provides MotionPlus™ compatibility while al¬lowing easy access to controls and unique wheel colors help personalize your gaming experience. The family pack allows everyone to join in on the gaming fun.